Pro II Epistar 80 (400W). Pro II Epistar 120 (600W). Pro II Epistar 160 (800W). Pro II Epistar 320 (1600W). Pro II CreeLEDs 128 (600W). Pro II CreeLEDs 256 (1200W). 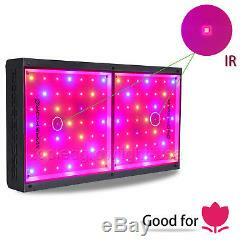 Mars Hydro Eco 98 (600W) LED Grow Light for Veg Bloom. Good for beginners, 24 plants; new SMD tech, no lense issue. High Power 5W Epistar Chip. 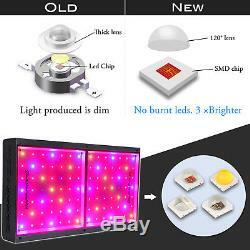 Newest SMD tech with high-intensity 5W epistar chip, no lense, 100% output, less heat and burnt issue. 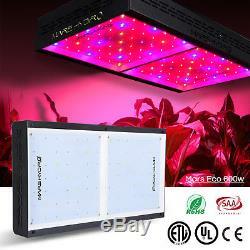 Compare 300600w HPS while consume 50% energy. Core coverage 3x2ft, max 5.5x3.5ft. 12 band spectrum with high red ratio, ensures maxim photosynthesis, high yields, THC, vitamins. IR good for flower, looking dim than others. 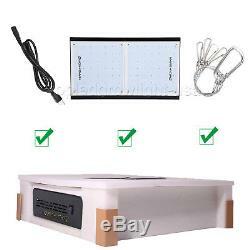 Qualified fans and heat sinks, cooling holes around the light case, high efficient for heat dissipation. ETL, CE, RoHs, UL certificated, 100% safe for use, zero fire or burnt issue. Each light with an daisy chain outlet and socket, available to connect max 10pcs lights together. Please NOTE the total power draw must be less than 1000watt. Easy Use with On/Off Switch. Only use one switch for whole grow stages from seedling to veg or flowering. Each light matched with local standard plug, just plug and play, no need of ballast or other accessories. ETL, CE, RoHs, UL certificated. Full spectrum with red, blue and white leds. New SMD chip, no lense, less burnt and heat issue. Powerful but energy-saving, deduct your billings at 30%. 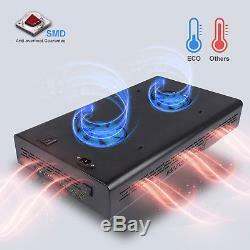 Efficient cooling system with qualified fans and heat sink. On/off switch, just turn on the light for bud, growth, bloom. Plug and play, no need to add ballast or other accessories. 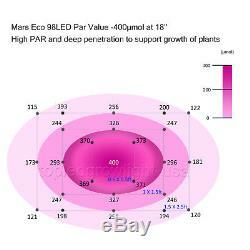 Item Model: Mars ECO 98 LED Grow Light. 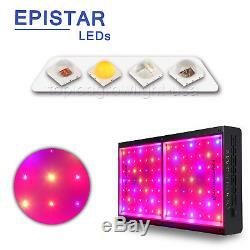 LED Diode Brand: Epistar (HI-LED) High Intensity. LED Diode Quantity: 98 Pieces. Core Coverage: 2' x 3' (60 x 91cm). Max Coverage: 3.5' x 5.5' (106 x 167cm). Compare to HPS/MH/HID: 250 watt. Dimension: 20" x 11" x 3(51 x 25 x 7cm). Par Value at 18: 445? Noise Level: 51 DB(decibel). Operating Temperature: 85°F -105°F (30°C - 40°C). Spectrum: 430440nm, 450475nm, 620630nm, 650670nm, white. 1 x Mars ECO 98 LED Grow Light. 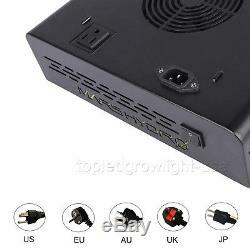 1 x Power Cord (Suitable for your country). 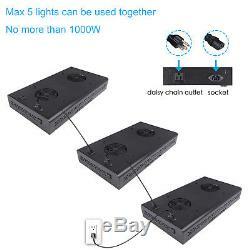 Each box with one light; Plain package guaranteed. Recommended Hanging Distance: Seedling: 24"-30", Veg: 18"-24", Flower: 12"-18". Recommended Lighting Time: Veg: 18/6 or 20/4h (on/off), Flower: 12/12h(on/off). Keep the light away from water, sulfur, acid, which will destroy light easily. Light must be under stable voltage, instability affects working life. Don't look directly at light when it's turning on, wear LED Glasses. 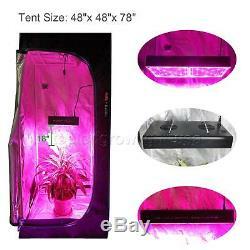 We provide advanced indoor grow equipments: Mars led grow light, grow tent room, glasses, rope ratchet, smell proof bag; and led aquarium light for fish reef tanks. Worldwide local warehouse available: US, Canada, Australia, UK, Germany, China. If any quality issues, please take clear pictures and send to us. We strive to resolve all issues in a timely manner. 30-Days hassle-free return or replacement. People who bought this item also bought. Mars Hydro 39"x39"x70 Indoor Grow Tent 1680D Reflective Non-toxic Oxford Cloth. 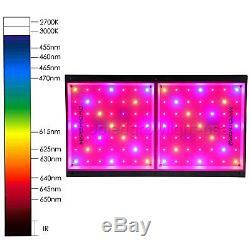 Mars Glasses for LED Grow Light Room Eye-Protective Anti UV/LED Indoor/Outdoor Hydroponics. Mars Smell Proof Bag Dog Tested 5.5" / 6.5" / 10.5 Discreet Smoker. 2PC Mars Rope Ratchet YOYO Hangers Height Adjustable. 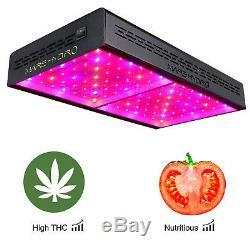 The item "Mars Hydro Eco 600W LED Grow Light Full Spectrum Indoor Grow Veg Flower Plants" is in sale since Saturday, September 8, 2018.